Virtual Teams: Future of Human Capital - Veristrat Inc. Virtual teams are transforming human capital of new age organizations. Virtual team consists of team working from various locations such as client site, different offices of the company, home etc. Virtual teams collaborate people with different skill sets and departments of the company, or specialists outside the company, working together with the aim of achieving common purpose. Virtual teams provides flexibility to senior management or project managers to manage tasks with the virtual team, while any of them being away from the workplace. Challenging and competitive business environments together with the collaboration of businesses globally are transforming the requirements of tasks performed by the workforce. Diverging from traditional modes of doing businesses, today’s businesses thrive to provide wide array of products and services across geographies in domestic as well as international markets. To cater the need of human capital, collaborative businesses are employing distributed personnel to bring in geographically diversified and specialized workforce in the form of virtual teams. Automation and digitization of the connecting world provides convenience to employees to stay connected anytime and instantly, thus reducing the need of physical workplace to perform tasks. Market competition, access to information and awareness requires serious commitment from employees and is dissolving differences between professional and personal life. Thus, employees are thriving to be the part of virtual teams. Virtual workforce helps an employee to manage work life balance in today’s busy world, availability of more time as being a part of virtual team saves time required in commuting to office, preparations for getting ready etc. Apart from advantages of virtual team, there are several disadvantages of virtual team also like requirement of team communication, coordination and collaboration to accomplish common objectives. In order to address the changing work requirements of employees, organizations have begun to integrate towards the formation of virtual workforce by adding in technology to improvise communication and operational capacity. Firstly, with the participation of freelancers possessing marginal talent like parents staying at home, retired people, student etc. Thereafter, with the globalization of businesses that required employees to work for unusual hours and to work with international teams and customers. Finally, with the emergence of global teams and businesses there was a concern raised by the team members that while working away they feel apart and often miss team collaboration. However, with the emergence of modern day interactive technology to communicate and task management platforms there is a paradigm shift in demand of forming virtual workforce. Specialized Workforce: Virtual teams provide specialized workforce that is focused and has updated knowledge in particular field. Efficiency: Virtual teams provide operational, financial and managerial efficiency as leverage of virtual team allows business men or professionals to focus on business development and other core activities. Non-core Activities: Virtual teams provide workforce to companies that are exposed to or want to enter into another industry in which they do not have their core expertise. Cyclical businesses: Virtual teams can be hired by businesses that require specific skill set during the specific time of production or service management cycle. 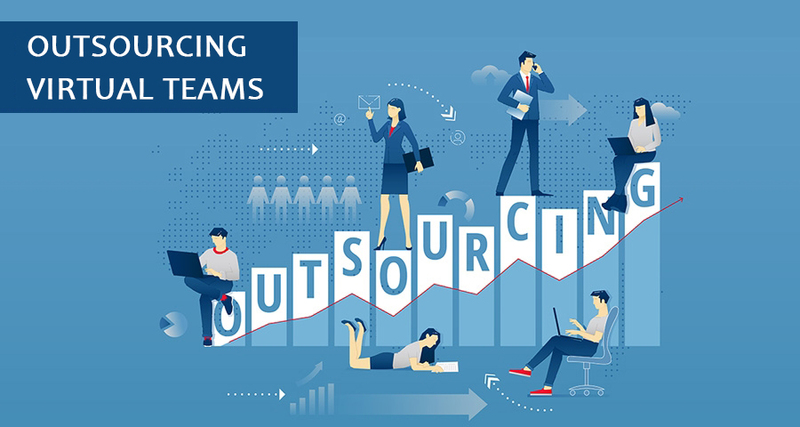 Cost sharing: Outsourcing virtual teams provide benefits of sharing the cost of workforce with other companies, as the workforce can be hired on contractual basis rather than retaining full time employees. Training cost: Virtual teams provide specialized skills to the company without the burden of costs associated with hiring and training employees. Diversity: Apart from providing specialized skills virtual teams provide benefits of geographical, linguistic and cultural diversity when businesses are exposed to different or new markets.